The fuel injection system is the most important component in the working of C.I. engine. Overall performance of the engine depends on the many factors but the some of the important are, power output, economy etc, and it greatly depends on the effectiveness of the fuel injection system. The injection system has to perform the important role of initiating and controlling the whole combustion process.Common rail injection system is one of the types of solid injection system. It was developed by M/S. Vicker Company. A spring loaded bypass valve on the header maintains the constant pressure of 330 to 530 kg.cm in the system and returns all excess fuel to the supply tank. 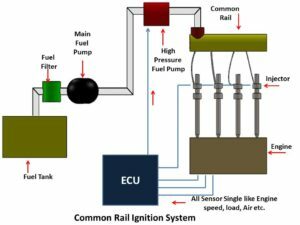 In this system the fuel is distributed to the injector from a high pressure accumulator and through a rail and this rail is common to all the cylinder, because of this only it is called as common rail injection system. The quantity of the fuel and atomization are controlled electronically using a programmable control module. Many fuel injection systems are now available in the field of automobile. Each injection system is different from each other. In this system the liquid fuel is injected directly into the combustion chamber without the aid of compressed air. The factor which differentiates the common rail injection system from other injection system is that the fuel pressure is independent of the engine speed and the load condition. It allows flexibility in the controlling both the fuel injection quantity and injection timing and because of this the better penetration and mixing of the fuel even at low engine speed and load. It is same as available in other automobiles where the fuel is stored. it is used to supply the fuel from the main fuel tank to the injection system. It is used to measure and pressurized the fuel for injection. It is generally a reciproacting type pump. It is used to ensure the fuel injected is according to variation in the load. Used to take the fuel from the pump and distribute it in the combustion chamber by atomizing it into fine droplets. To prevent the dust and abrasive particles from the pump and injector. 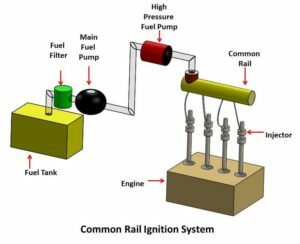 Working of Common rail injection system can be understood in following points. In the beginning a pump supplies fuel under high pressure to a fuel header. This High pressure in the header forces the fuel to each of the nozzle situated in the cylinders. At the appropriate time, a mechanically operated mechanism valve allow the fuel to enter in appropriate cylinder. The header pressure must be that for which the injector system was designed because the injector system is differ in dimensions as the dimensions of the engine changes. It must enable to penetrate and diapers the fuel in the combustion chamber, combustion chamber is the place in the engine where the fuel catches the fire and produces high amount of energy which leads the vehicle forward. The amount of the fuel entering the cylinder is regulated by varying the length of the push rod stroke. A high pressure pump is utilized for providing fuel to the header, from where the fuel is estimated by the injector. You can see clearly in the figure that the numbers of cylinders are being used in this system, so the injector fitted to each cylinder to measure the fuel. When the fuel injected (infused) into the chamber, it has to be measured. The measurement of the fuel infused into the chambers is controlled by the lift of the needle valve in the injector. The duration of the injection system depends on the length of time and the position of the valve. The amount of the fuel injected in the cylinder is depends on the duration, size and number of holes in the nozzle tip and the fuel pressure and air pressure in the cylinders. The whole thing is controled by the ECU. Why we adopt Common Rail injection system? To atomize the fuel into very fine and tiny droplets. Uniform spray pattern to ensure rapid mixing of fuel and air. To distribute equal quantities of measured fuel to all cylinders. To eliminate the dribbling of fuel droplets into the cylinders. 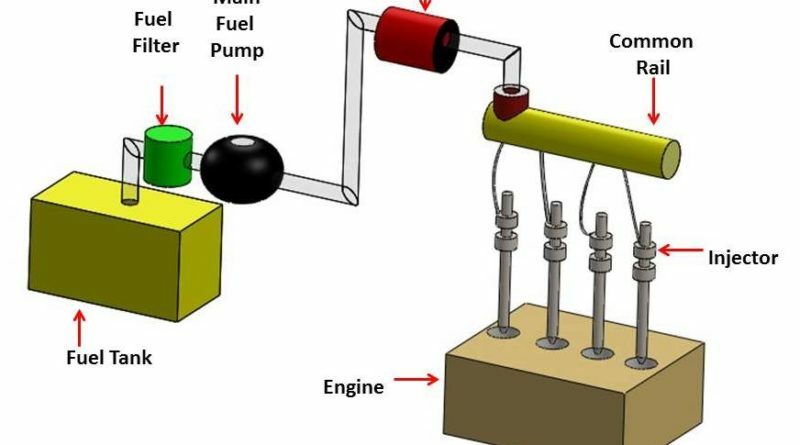 Timing the injection of the fuel correctly in the cycles in order to obtained maximum power. To ensure fuel economy and clean burning. Accurate measuring of the fuel injected per cycle. It is very critical due to the fact that very small quantities of fuel being handled. Produce high power and makes the technology more suitable for passenger vehicle. Gives the better fuel economy and clean burning. Reduce the cost of operation. In case of diesel vehicle it improves the performance around 25%. Engine run more smoothly, high efficiency and low fuel comsumption. Reduction of the particulate emissions. Only one pump is used for a multiple engines. System should have very accurate design. There is possibility of developing leakage at the valve seat. Overall cost is high as the high pressure pump and electronic control unit are used. This is all about common rail injection system. If you have any query regarding this article, ask by commenting. If you like this article, don’t forget to share it on social networks. Subscribe our website for more informative articles. Thanks for reading it. 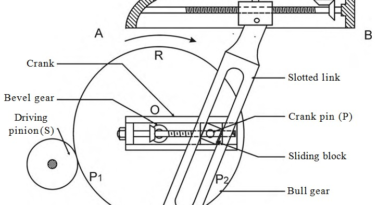 ← What is Centerless Grinding? What are difference between Centered and Centerless Grinding Process?